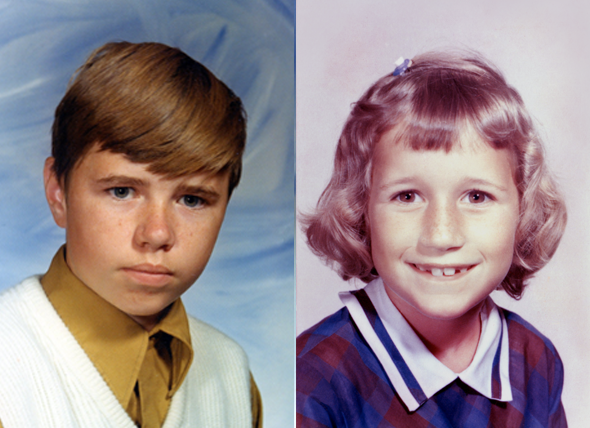 Len & Lisa, sometime in the 1960’s. Aloha, everyone! This is the official beginning of the BanyanTreats Blog. Lahaina is a long way from everything else on Maui, about 30-40 minutes from Kihei and about 45-60 minutes from Kahului—without traffic. “It’s so far from everything else, and do we really want to get into the restaurant business?” I asked. (Len has 35 years of home construction under his tool belt and I am an illustrator/packaging designer.) We decided against it. But when Len noticed the ad was still posted about two weeks later, we thought, Hey, it’s a job—on Maui—which is what we both need. It might be fun to serve ice cream. So we decided to see if we could figure out which shop it was. That was our introduction to Roselani Ice Cream. Is it good, you ask? Let’s just say you don’t forget when or where you try it for the first time! The location of the shop was, in a word, perfect. Right next to the famous Lahaina Banyan Tree, in the Pioneer Inn Building, (one of the oldest hotels in the U.S.) facing the equally famous Front Street, known for its shopping and galleries. It was ideally situated for the tourist trade. We finished our ice cream while sitting in Banyan Tree Park. “How much does he want for it, again?” I asked. The rest is history. Exactly one hundred years after it opened in 1913, we purchased what used to be the confectionary stand that had served ice cream and sweets to patrons of the old Pioneer Inn Movie Theater. 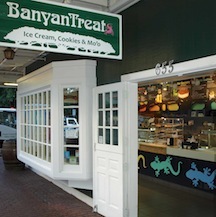 Since the seller had owned two shops by the same name (Hula Cookies and Ice Cream) we decided to rename it BanyanTreats. Hopefully it would be more memorable and easy for patrons to guess at the location. 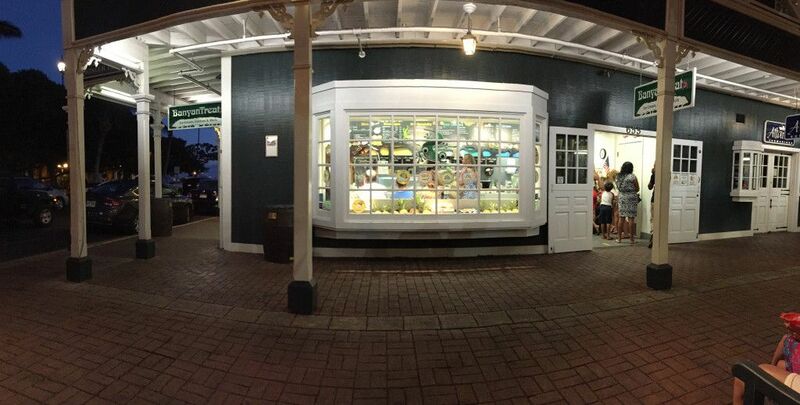 It was only a couple months after officially changing the name when Cindy with Local Tastes of Maui walking tours informed us the shop used to be called Len’s Sweet Shop. We no longer had any doubts as to whether or not we were meant to be here. 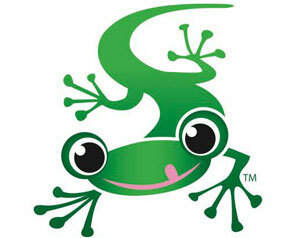 We redecorated with brighter colors and adopted the mo’o (Hawaiian for gecko or lizard) as our mascot. My training in advertising and fine art came in handy for the remodel, as did Len’s carpentry skills. We got busy cutting out the new giant menu chalkboard in the shape of a banyan tree and a series of five colorful mo’o’s to grace the front of the sales counter. We remodeled a few areas in the back as well as the front. We never closed the store completely for renovations, and celebrated a “Grand Re-opening” in September of 2013 as BanyanTreats with Pastor Laki Ka’ahumanu giving the blessing. The mo’o (pronounced “moh-oh”) often appears in Hawaiian legend and is considered good luck. (They’re also great bug-hunters!) Our little mo’o is incorporated into our logo, and is living up to his reputation as a good luck charm! We will have been up and running as BanyanTreats for three years, as of May 2016. So, if you’d like to know what’s going on in and around Lahainatown, subscribe to this blog in the sidebar on the right. Check back in August to get your free downloadable coloring page! Wishing you aloha until we “meet” again! We do not like spam any more than you do, so we will never sell or abuse your email address and you can unsubscribe at any time. To Sign up for our Newsletter or Contact Us! CLICK HERE.